Wednesday was a hint at a beginning. We had a warm afternoon and a big snow melt and the sky was bright at six when I walked to the house for dinner. I heard the first peeps of springtime birdsong. I passed the horses eating their hay in their mucky winter when it hit me—everything’s heading for the big change. This is my first New York winter, and everybody warned me before I moved here. It would be snow-filled, isolating, and interminable. I don’t think it was a terrible as anybody said it would be, but it does come with a certain feeling of endlessness. But now, it actually is ending, and the signs are everywhere. We have a new slogan on the farm right now: Embrace the Fear. Everyone here can feel it. We have broiler chickens coming on Wednesday morning. Sam and Brooke rushed to build a brooder coop for them, and it’s beautiful, but Monday and Tuesday they will have their hands full putting finishing touches on it—setting up plumbing and lights to keep those little lives toasty. Monday night, we’re going to wait until after dark and the laying hens are roosting to move them from their winter home in the hoophouse into their mobile coop. Chickens are hard to catch when they’re awake, but they are complacent when sleeping. They tend not to put up much up a fight when grabbed from their roost, just a mildly irritated, confused cooing. They will move to their old spot on the compost heap, and we’ll clear out the hoophouse on Tuesday. We’ll open up the side walls and doors, do some cleaning, and get the hoophouse ready to go for our first seeding of the season on Friday. Which feels very, very hard to believe. The unbeatable cotyledons of spinach have pushed up in the movable hoophouse by the vegetable fields. Another true sign of spring’s arrival is the maple syrup we boiled down this weekend, light, sticky, and filling up jars. The seeds have arrived from Johnny’s and Fedco, the seed fridge is packed full, and the germination chamber is ready to go. So we’re embracing the fear. Spring is full of beautiful promise, and I can already see and feel the effect of two sunny, weekend days. But it is also a big leap into challenges and states that we can’t know. Will it rain? Will weasels wreak havoc on our broiler chickens? Will our cows calve easily? Will all the farmers be okay—happy, content, safe, productive, healthy, fulfilled? We do know that there will be setbacks as well as success. Not knowing what those will be is the name of the game as well as the origin of fear. So what do we do? We give the whole thing a big, terrified, hug. Most of the views on this farm are familiar. Last year’s running all over the farm fencing in all kinds of animals afforded me some bucolic gems—the view of 2013’s vegetable field from the triangle of weeds where we grazed the horses in desperate drought-induced ingenuity, the whole farm view from the top of Beef Hill, the eastern side of the barnyard seen over a stretch of clover, the back pasture. The picture that confused me is the view from the scaffold where Matt was putting up siding on the new building, a view I haven’t seen. 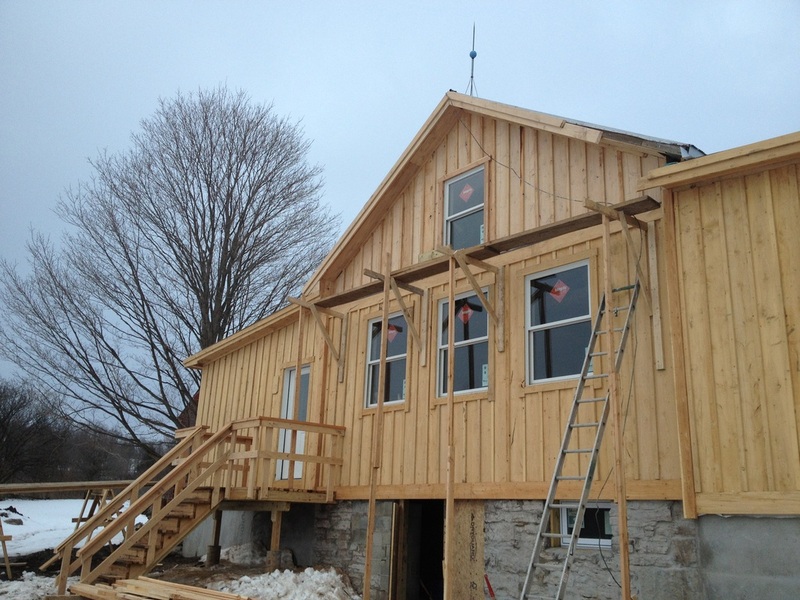 The building he is working on is the hope of Greyrock Farm. I try not to think in absolutes, and also try not to place all my eggs in one basket nor count chickens before they hatch, but it’s hard not to think of this building as a real game-changer for the farm. In its prior incarnation, this was the old machine shop on the farm. It was crowded with tools, lengths of hose, a complete glass pipeline for a dairy, broken things and old things. The dark, crumbling basement was where we wintered pigs. In September, Matt started clearing the whole thing out, and in October, Dale Rodgers and Erik Wardle came from Vermont to get the project moving. It has been a wild experience, not without its hardships. In the toughest moments, I tell myself that this is all in the service of learning, of experience. But with the siding up, with walk-in coolers framed out and waiting for insulation, this feels like it could actually be real. The center of the building, the old machine shop, will be our new distribution space. Instead of shivering and watching vegetables freeze in our current set-up in the old dairy barn, we’ll have a comfortable, heated space for CSA members and Farmstand customers. We’re hoping that in time, this space will become an aggregation point where restaurants and eaters can find food from a range of local producers. The south wing holds three walk-in coolers, which will allow us to store our produce, as well as produce from other growers. We also have space for a walk-in freezer, which is a dream for another day. The north wing will have a food-processing kitchen where we can preserve food on a commercial scale. It will also be where the farm crew cooks and eats meals, which is a huge improvement over the cramped kitchen where we currently eat. The new basement, with its slick, radiant heated floors, will have a shower, some storage, housing for visitors, and probably an office and hangout space for farmers. A friend dropped a combination foosball-air hockey table off last week, so that could make its way in. It’s a promising new view. In our best hopes for the farm and for this new project, the building becomes a community space for movies, lectures, and meetings. We’re adding our part to the growing food movement in our area, making it easier for our neighbors to find the food they want to eat and for farmers to get it to them. Now and then, of course, we’d also like to have a rowdy barn dance. You can learn some more about this project—also about donating to help fund it—over at the “Barn Renovation Project” tab on our website. It’s not a great excuse for such a long blog silence, but I’ve been on vacation. Matt and I visited family and friends in San Francisco, headed to New York City for a few days, and then went on to a farming conference in Pennsylvania. February is conference season for farmers—we’re caught at a slack time, cooped up inside for a few days with incredible, innovative farmers, and we return to our farms with a burst of energy just before the growing season begins. Before vacation, we went to Saratoga Springs for our first conference of the season. Luke is headed to a dairy conference in Auburn, and I think a Vermont conference is on the horizon for Sam and Brooke. My feelings are predictable after a conference. I come back to the farm super-charged, grand visions of new tools to buy or build, little tweaks and big changes. I like to give myself to overexcitement for a day or two, and then I reel in. I digest the whole thing, try to figure out what would actually work and what changes are, for now, better left as dreams. One big change for this season is irrigation. We have rapidly draining soil, and after last year’s dry summer, it’s clear that having no plan for irrigation is just reckless. I’ve been staring down a brutal lack of experience on my part and trying to learn as much as I can. I’ve got some ideas, but next on the list is calling every vegetable grower I can get my hands on. I have very little idea of what has happened on the farm in the past two weeks, so sorry this post is short on farm news. We got some round bales delivered for the beef herd. We gave up on keeping any winter greens in the hoophouse, and now the laying flock is inhabiting the whole thing—we are getting over 100 eggs daily. We are nearing 11 hours of daylight each day, and things are getting ready to really grow. In lieu of news, let’s talk ideas. In this planning season, I’ve been feeling the little stresses of the unknown. I am making long spreadsheets of seeds to order and when to plant them, plans for how we will harvest and water, and wondering—will we have enough food? Will we have too much food? Who will buy it? Will we have time to harvest and sell it all? Are we getting a good price? I keep coming back to the money thing. Some farmers use metrics to determine a fair price for their food, weighing seed cost, man hours, fuel, and a handful of other factors, but I can’t help feeling something is lost here. It’s an abstraction and those are only sometimes helpful, but I am trying to see the food that we grow and raise as a gift. I’m conflicted about this mind frame I’m trying on. What does it mean? How can I make any money if, instead of selling food, I give it away? I am a farmer, a businessperson hoping to make a life for myself, to someday live in a comfortable house, to take vacations, to retire. But farming is a peculiar business. The food we grow feels so special, and so hard won, that any monetary value we place on it seems meaningless. What do you pay for security? It would be incredible if, at our Farmstand, instead of weighing pounds of potatoes and paying us an arbitrary price, customers reciprocated our gift of food with a gift of the value the food had to them. It would more often than not be money, but maybe it would be a lesson, or time, or a bunch of really funny jokes for a bunch of carrots. If you don’t get out to have fun in the snow, why would you live here? This weekend was a rare one. Matt wasn’t milking and I wasn’t doing animal chores. Neither of us had any obligations or plans, our weekly farm work didn’t flow into the weekend, and Matt’s ever-ringing cell phone was blissfully quiet. It was a perfect weekend for fun with horses. On Saturday morning, Matt hitched Pat and Pearl and hooked them up to the bobsled. We loaded some wood scraps from our barn renovation project onto the sled for deposit on the burn pile—so maybe a little bit of weekly farm work did flow into the weekend, but when you’re gliding over snow through an open pasture and the horses are being just totally perfect, it’s really hard to feel like you’re working. I was surprised by the bobsled. It’s a barebones thing and people mover—just runners and decking. We sat on a well-placed hay bale and that was the fanciest thing about the operation. But the motion was incredible. We got the horses going at a trot through snow up to their knees, and I couldn’t stop smiling. It was like a magic carpet, or riding a broomstick, but it was real, there was no trick, and it came along with the promise of a future of crisp weekend bobsled rides. After we dumped the wood onto the burn pile, we turned around and headed to Beef Hill, the wide, north-facing slope where we grazed the beef herd this summer. When we got there, Tim, driving Bear and Duke, was pulling some friends up the hill on a toboggan. 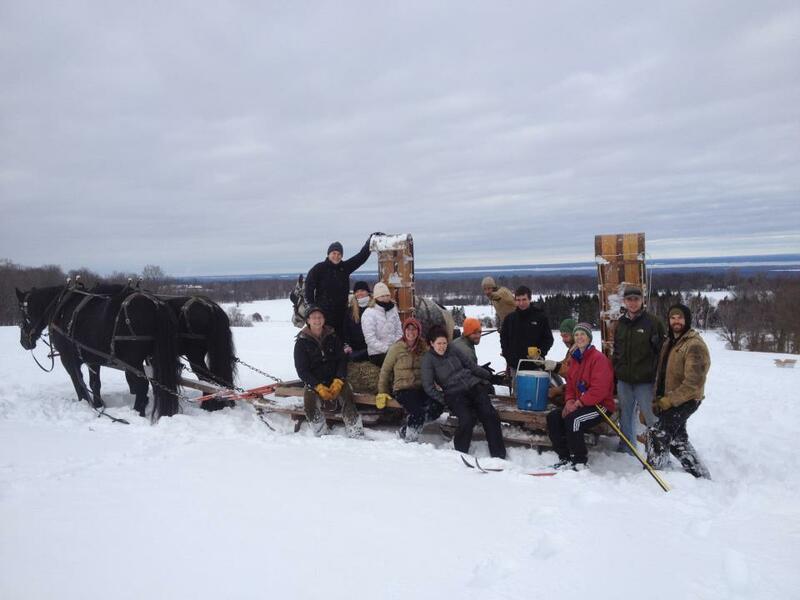 A dozen friends and neighbors were there, toting sleds, snowshoes, skis, and tractor inner tubes, taking advantage of our very first horse drawn sledding adventure. A few days before, someone had come up with the idea of having the horses run in a loop—they would pull people up the hill, the people would sled down, and the horses would meet them at the bottom to pull them back up for another run, eliminating the hardest part of sledding, the walk back up the hill. It worked like a dream. It was good, hard work for the horses, I got a face full of snow on a blockbuster toboggan ride, we drank hot chocolate and caught up with friends we hadn’t seen in a while. It was some serious fun, and just like the bobsled ride, there was the feeling that this was just the first time. It’s a good day for a new blog. If you’ve been following us for a little while, you might remember our old blog—neglected and rarely updated, the last post was from January 1st, 2012. So on the one year anniversary of our old blog’s farewell, here we are, starting fresh. We’re hoping to give this one a little more attention, hoping to keep in better touch with all of you reading out there by bringing you the latest farm news. Call it a new year’s resolution. The question I am most frequently asked this time of year is, “So what are you actually doing on the farm right now?” The past weeks have brought us loads of snow, and if there is anything green growing in the world, I haven’t found it. 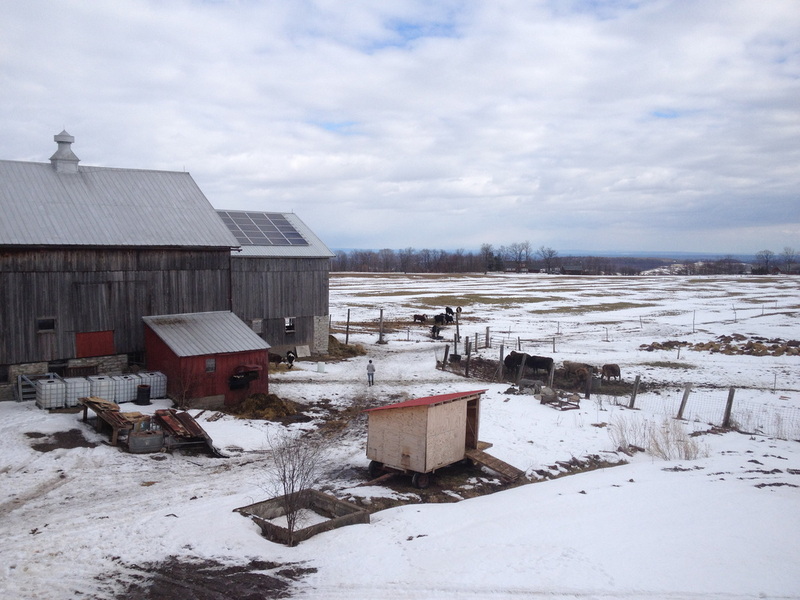 So what is there to be doing on a farm in the middle of winter? The answer, of course, is lots. Our dairy cows are still milked twice daily and are giving us very respectable amounts of milk. Our beef cows and our pigs need to be fed every day, and with temperatures staying solidly below freezing, bringing them water can be a challenging task. Our laying hens are still laying, so we have eggs to wash regularly. Sam slaughtered a steer today, Brooke is rendering lard, and since our CSA distribution and Farmstand are open year round, setting out our storage vegetables and selling them is Rochelle’s weekly gig. Beyond routine, winter is a time to tinker, mend, and refine. I know that Tim has at least one cultivator to refurbish, and finding a fix for the two broken points on Matt’s plow would be nice. During the growing season, you can always hear a farmer saying, “Well, that’s a winter project.” In these snowy months, we start on those things that we were too busy to tackle in season. My favorite part of this season is the dreaming. We’re a young farm, still in the making, so possibilities are boundless—a reality that is exciting and overwhelming. I’ve been spending time doing the seed order, which is just the concrete end of some wild hopes and decisions about what the farm will look like in the coming year and years. I’ve been staring at maps of the farm and thinking about where our perennial plantings will set their roots and the best ways to irrigate our vegetable plantings. It’s a heady feeling, spending time figuring out the intersection between my desires and the farm’s potential. Keep your eyes posted to the blog—more heady feelings, cute animal photos, and a whole lot of unknowns in the coming year.